There are an impressive number of shows in the Brighton Photo Fringe Open this year, and some are of a very high standard, others of course rather less so. Organising events such as this must be extremely tricky and I suspect those responsible will be a little frustrated at some of my nit-picking after all their hard work. But I hope they will be taken (and are meant) as constructive suggestions to improve the festival in future years, especially for visitors coming from outside Brighton. As with the Biennal, several of the venues – including the major ‘Fringe Focus‘ – were closed on a Tuesday. Some other shows listed either did not exist or I was unable to find them. It would be considerably more helpful to divide the shows in Brighton into areas each with its own local map and fuller key rather than the large area map provided. This would enable precise locations to be shown – numbers which are seldom actually present on the streets are of little use. Finding the work – for a visitor to Brighton – was something of a logistical nightmare and there were a number of shows that I looked for but could not find at all, and some I did eventually find were invisible from the street – not even a small ‘Brighton Photo Fringe notice in the window – and so could easily be overlooked. Then there was the gallery I walked past three times, and twice the door was locked with a notice saying ‘Back Soon.’ Nothing the organisers can do about that of course. Although the map gave opening and closing dates for shows, to find which days and at what times they were actually open meant consulting a separate booklet, arranged in a different order to the map list and not making use of the numbers on the map. Again with so many shows – and doubtless more in 2012 – it would also help if this were broken down into geographical areas. It was actually hard to find a copy of the booklet, so many who visit this year will only have the map, so it is unfortunate that these details were not on it. The show I was most sorry to miss was ‘degeneration‘, a project by the collective ‘Human Endeavour‘ which “is a study of key areas across Britain” – Glasgow, Edinburgh, Leeds, Liverpool, Salford, Sheffield, Birmingham, Cardiff, London and Portsmouth – “of 20th century housing that has slowly fallen into decline and is now due for regeneration.” It’s a project that fits very well with my own interest in urban landscape – for example in my work on Hull – that arose out of an active grass-roots involvement in the redevelopment of Hulme and Moss Side, Manchester when I lived there in the 1960s. So far all I’ve seen is a nicely printed folding card with one image by each of the photographers, Alex Currie, Richard Chivers, Simon Carruthers and Oliver Perrott and a well-illustrated web site. This is the third show by this collective and the second to receive Arts Council support. Looking at the work on the web, I was particularly impressed by the pictures from Glasgow by Alex Currie and Richard Chilvers. It was interesting to be reminded again of the work of Michael Ormerod, (1947-91) a British photographer who took to America very much in the footsteps of Robert Frank and Stephen Shore. Ormerod died in a motorbike accident at the age of 44 in Arizona in 1991, and shortly afterwards there was a show of his work at the Zelda Cheatle Gallery as well as a book to accompany this, ‘States of America‘. While I quite like some of his large colour images, I can’t help looking at them and thinking that other photographers – such as Shore – have done it rather better. I get a similar feeling too about his black and white, which perhaps also leans too heavily on American precedent without really establishing a voice of his own. 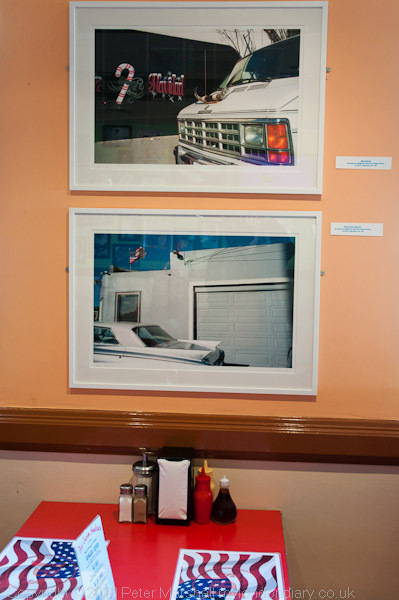 Ormerod was a pretty good photographer and I quite like his work, but… You can see for yourself at the Crane Kalman Gallery. Was he one of the UK’s leading photographic talents at the time of his death in 1991 as the exhibition text suggests? It’s something you could say (if you were an art dealer) about any of several hundred photographers of the time – many of whom might well have taken rather similar pictures on a trip across the USA, and some did. 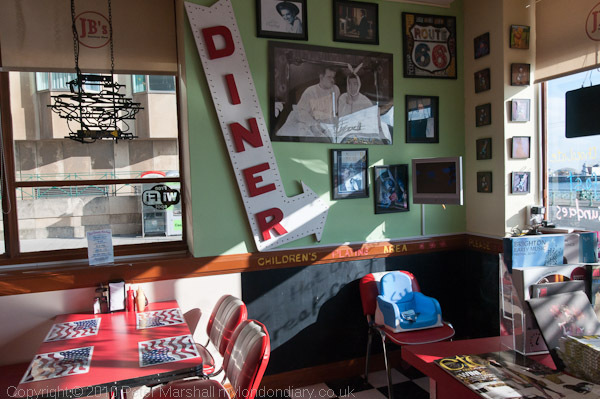 The USA was also the source of another show on the fringe, shown in JB’s American Diner on Kings Road. I found this a more interesting view of America than Ormerod’s, partly because it played a little further from some of the stereotypes but I think largely because it’s subject was so much more clearly defined, with Kit Fordham focussing his attention on ‘Bascom Avenue: The Unloved Hear of San Jose, California.’ The show starts here on Fordham’s web site, although I think the colour was better on some of the prints than in some of these on the web. There was a synergy between the show and the surroundings that worked well and it was the only venue where I really felt I had to take some pictures myself. It can be hard showing work in cafés and shops and this was a great example of how it can really work well. But the outstanding show of those I saw was ‘Closer‘ by Stuart Griffiths, even though looking at his web site I see very clearly how much stronger a show this could have been. I find it hard not to see the presentation at the Phoenix as an example of a kind of curatorial vandalism, pushing his work into a rather different aesthetic. Of course I’m not a great fan of the cult of the curator, which I think has been a curse on photography, particularly in the UK, for the last forty or so years. The show still worth seeing for the rawness of some of the images, but afterwards look at the web site and see how much more it could have been. It’s a pity that they didn’t get around to adding labels to the works (obviously actually a deliberate decision but equally obviously an poor one) but you may be lucky and be given a list of them if you view the show. I’m not sure how much the smaller room given over to small pictures and letters from Griffiths’s time in the Parachute Regiment from 1988-93 where he became a unit photographer with the Intelligence Section in Northern Ireland actually adds to this as a show. What is perhaps much more relevant is the film about his life, Isolation, was shown as part of the Photo Fringe at the Electric Palace, Hastings on 10 October, and will also be projected at the venue for this show, the Phoenix, Brighton, on 30 October. You can read about it in The Guardian which also has a gallery of his pictures. Isolation had its World Premiere at the 2009 Edinburgh Film Festival and from there you can watch a short trailer which includes some of his still images. 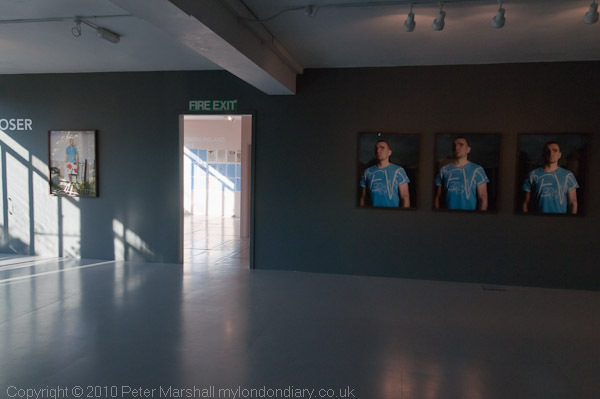 I could see no point for the use of three very similar portraits shown in the installation picture above – and it suggests a kind of indecision that although doubtless a decision by the curator seemed to suggest that the photographer was unable to arrive at the image he wanted. Griffiths actually chose a different image from the session for his web site in the series ‘Back From the War’, where you can also see some of the other powerful images that were not selected for the Brighton show. It was, despite the weather forecast, a pleasantly sunny day for a walk around Brighton, although at times a little frustrating. As well as those I’ve written about I saw quite a few other shows which for various reasons – largely that they didn’t particularly excite or interest me – I’ve not mentioned. I’m very aware of having missed much of both the Biennial and the Photo Fringe, partly because some things were not open, but also because this is a very widespread festival – as well as the more outlying areas of Brighton & Hove there are also Fringe shows in Chichester, Lewes, Peacehaven and Portslade and the Biennial also has related photography shows in Portsmouth, Bexhill, Chichester and Eastbourne. 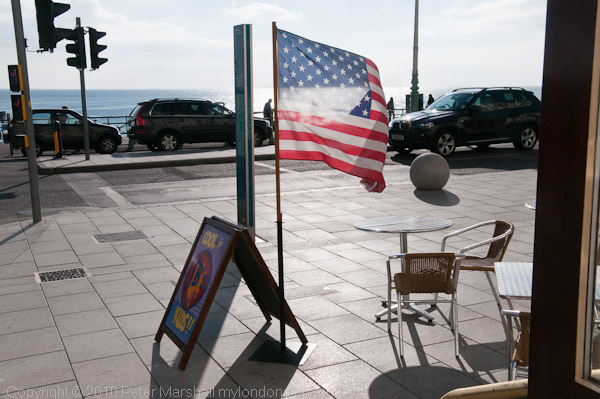 There are of course all kinds of events too taking place in Brighton and elsewhere, making this a considerably more exciting event for photographers based in the area. For some years Brighton has been establishing itself as a major photographic centre in the UK, and in many ways I think more important and certainly more vital than London, which has largely failed to develop a photographic culture, largely due to the stultifying effects of some of our major institutions, but also because of its sheer size. This year’s festival marks another step along that road. This entry was posted on Wednesday, October 13th, 2010 at 03:19 pm and is filed under My Own Work, Photographers, Reviews etc. You can follow any responses to this entry through the RSS 2.0 feed. You can leave a response, or trackback from your own site.